TS POLYCET 2nd Counselling Dates 2018: Telangana Polytechnic second shift web counseling & certificate verification schedule is available now. Candidates can attend 2nd Phase certificate verification & web counseling as per given schedule below. 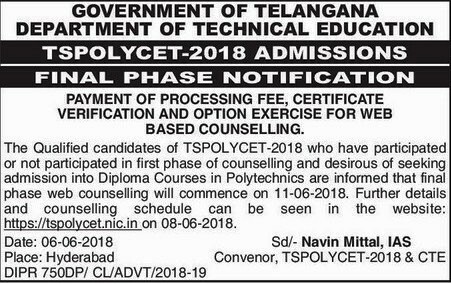 Candidates can check detailed schedule, notification, required documents, counselling fee ect of TS POLYCET 2018 at www.tspolycet.com. The candidates who have participated in Phase-I Counseling can also exercise options using their old password, Login ID, for the leftover seats now available and consequential vacancies that may arise in the process of allotment as per the schedule given below, and it is advised to exercise options for interested Colleges assuming that vacancies are available in the course of their choice. Schedule for Certificate Verification & Exercise Options for All Locations. Allotments will be placed in the website https://tspolycet.nic.in on 13-07-2018 after 8:00 P.M. IMPORTANT:-The candidates shall refer to https://tspolycet.nic.in for information regarding addition or deletion of any Polytechnic Colleges/Courses up to the day proposed for exercising options. Options given in the Phase-1 will not be considered for allotment & candidates have to exercise web options afresh. Candidates who are satisfied with their previous allotment need not exercise options once again. Candidates shall note that if they exercise options now and a seat is allotted as per the options exercised a fresher, the vacated seat will be allotted to next meritorious candidate and hence they will have no claim on previous allotment which was vacated. The Special Category candidates (Sports/NCC/CAP/PH/Anglo-Indian) who did not get their certificates verified earlier should get their certificates verified now at Sankethika Vidya Bhavan, Masab Tank, Hyderabad only. Candidates residing in Quli-Qutub-Shahi Urban development area have to produce certificate of residence and ration card to take seats available in Q.Q.Govt Polytechnic, Hyderabad and they have to attend certificate verification at Q.Q.Govt Polytechnic, Chandulal Baradari, Opp to Zoo Park, Old City, Hyderabad. 2. The Tuition Fee payable after allotment varies between Rs. 3800/- to Rs. 15500/- per annum depending on type of college allotted. The reimbursement of Tuition Fee in respect of all eligible candidates will be as per the orders issued by The Government of Telangana and Andhra Pradesh States from time to time. However, all the candidates have to pay Rs 600/- towards TS-SBTET recognition fee as prescribed. sir i want to know ts polycet 2nd counselling date could you please tell me sir. thank you in advance. When is 2nd counselling? Please tell the dates sir! Sir date of second councilling? Do you have any idea that when we are going to get 2nd counselling schedule. i have been visiting the website and not getting the latest updates and i see the old updates are populating in website like 1st counselling was completed in June 1st week only and still those updates were not removed from the website.I don’t see any information related to 2nd counselling and tried to contact many helpline numbers but no response. could you please assist how to get latest information regarding 2nd counselling schedule. I visited bank to pay challan due to their server problem, I am unable to get it. Today is bank holiday. How to get bank challan through online. I missed 2nd phase counselling. Do I have a chance to get seat in Govt/private collage as spot admission? If yes, how about the fee reimbursement, am I eligible for fee reimbursement? You can directly select colleges in 2nd phase using your old login id details. Sir/Madam, I lost my first phase counselling login id and password. for 2nd phase counselling is continued with 1st phase login id or we may create a new login id and password. I got seat in Medchal in 1st phase. Now I want to change my college to masabtank or Ramantapur. my rank is 2441 (BC-D). If not get seat in those colleges, like to stay in medchal only. plz give me the order of options. Main problem is Hostel facility in Medchal. LIST OF HYDERABAD POLYCET COLLAGE WITH ADDRESS. waiting second phase counselling TELANGANA STATE. polycet second phase date waiting. Can we have the certificates verification before the second counselling? sir I named by gadagoju shiva I have got seat in a college but I didn’t satifie to that college so, I want to change my college so, pls say the second counselling dates2016 . I got 9770 rank and I had not came to counselling but now I want to join in polytechnic.so can I have chance to join in government. collages.I belong to ST caste. Yes you can attend 2nd counselling. My Name is sagar iam not attended polycet certificate verification,can you tell me where can i can go for certificate verification,and what is the procedure,and iam eligible or not for 2nd phase web counciling. My Name is sagar iam not attended polycet certificate verification,can you tell me where can i can go for certificate verification,and what is the procedure. is it possible to attend the Second counselling without attending the first one? Yes all the candidates who did not attended 1st counselling can attend 2nd counselling. iam sathish . igot 41448 rank in polycet , iwas attended for 1stface i got st mary college at deshmuk it was far from my village and also not satisfiet with that college . so what have to do now sir pleace help me sir. i want to attend for second counseling. plzzz tell me when the second counseling held?